Every body is different. Some of those differences are due to environment - such as daily movement patterns, injuries, or food intake - and some you are born with. And most are a mix. "Somatype" is a way of looking at your underlying body composition. This is the type of body you are born with. Most people have a mix of body types (and women tend to be a more mixed type than men). You cannot change your somatype only modify within the limitations. For instance an endomorph will never be tall and lean; a mesomorph will always have to continually work on flexibility. The stereotypical dancer in the West is an ectomorph. The ectomorph has a body characterized by tall, lean physique. Their bones are proportionally longer than the other types and are less dense - so are more fragile. They tend to be very flexible but with low endurance. They have a good nervous system (quick movement possible but also feels pain easily) but a poor digestive system (hence their lean look). When weight is gained it tends to go to the hips. In contrast, the mesomorph has a body characterized by a muscular physique with wide shoulders. This is your sporty type (or peasant!). They tend to be inflexible but with great cardiovascular systems and high endurance. Their bones and connective tissue is the densest of the three types. When weight is gained it tends to go to the waist and belly. 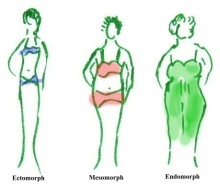 But potentially the best dancing body is the endomorph. This type is flexible and has good endurance; and both good nervous and digestive systems. It is least sensitive to pain. The posture is not as good as the mesomorph's but better than the ectomorph's. However, the very efficient digestive system means the body is characterized by an over-weight, well rounded, physique which is not valued in dancers. Knowing your body's leanings means you can know what you need to work on. For instance, ectomorphs need work on strength, control, endurance and learning to relax. What they tend to want to do however, is more flexibility work (which they often enjoy) but which can cause instability issues and injury. Mesomorphs need to seriously work on flexibility. Several times a week. And mesomorphs need an extensive cardio workout before tackling stretches which need to be precisely targeted. Endomorphs might look like the lucky ones, but they need to restrict their calorie intake. They cannot eat as much as their mesomorph friends - and nowhere as much as the inefficient ectomorphs. Doing more endurance work would seem odd - but it might help use some of that excess energy. Teachers also need to be aware of these differences and adjust for mixed classes. As a mesomorph, I tend to go for a long cardio-style warm-up - because I need that before tackling anything needing range of motion. But by the end of such a warm-up many ectomorphs would be too buggered to dance. What is more common, however, is an ectomorph teacher who has, herself, very good range of motion which she expects her students to also have leading to possible injury. Bottom line is we need to work with the body genetics has given us. Work on what can be changed and forget about yearning for a different body type. No amount of dieting will give a mesomorph or endomorph the ectomorph look. And as you can see, they have their own problems to deal with.